The national capital witnessed heavy dust storms on Wednesday, June 13, as the air quality index ranged between poor to very poor across the Delhi NCR region. The Environment Ministry said air quality in the city deteriorated beyond severe level and predicted that dusty conditions are likely to last till Friday. 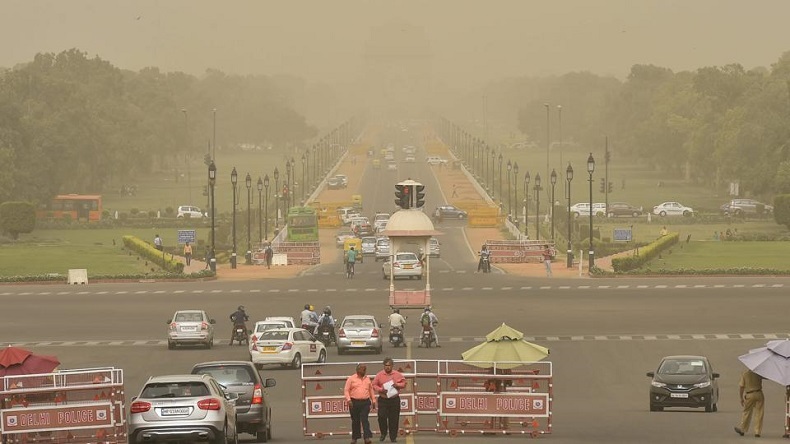 The air quality in Delhi deteriorated on Thursday, June 14, due to the massive dust storms in western India which increased rough particles in the air, the Central Pollution Control Board (CPCB) data said. According to morning readings, air quality across Delhi-NCR showed that PM2.5 levels remained in either poor categories or very poor, causing limited visibility. Worried over the hazardous situations, doctors across the national capital have advised people suffering from breathing issues not to travel outside or use a mask as the dust might result in causing serious respiratory diseases. According to CPCB the air quality index at many places in Delhi crossed the 500-mark, with East Delhi’s Anand Vihar area recording an AQI of 891. Reports suggest that the ongoing conditions are likely to last till Friday and the cause of this deterioration has been dust storms in Rajasthan, said the Environment Ministry. According to the India Meteorological Department (IMD), the current surface winds in Delhi are in the range of 5-6 m/sec. Reacting to the grim situation, Dr Arvind Kumar, chief of the respiratory division at Sir Ganga Ram Hospital told Mail Today, that he already has attended to patients, who had earlier breathing difficulties and were doing well but came back with complaints of a dry cough. On Wednesday, many construction agencies, municipal corporations and Delhi Pollution Control Committee were instructed to ensure water sprinkling around the capital. CPCB has called for an urgent meeting to discuss the implementation of Graded Response Action Plan.